Right Action for Women is dedicated to making sure all young women have access to the best prescribed screening available, including MRIs. An important step toward achieving this goal is Right Action for Women’s Financial Assistance Program. 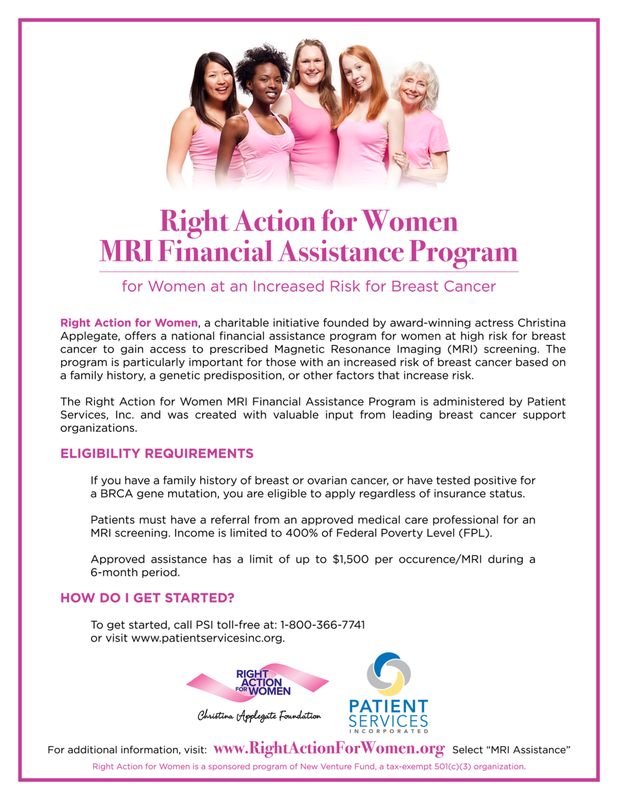 With support from Right Action for Women, Patient Services, Inc (PSI) offers a national financial assistance program to help young women who are at high risk for breast cancer gain access to Magnetic Resonance Imaging (MRI) screening. Here is where you can find more information about Patient Services, Inc and the financial assistance program. Together with Patient Services, Inc. (PSI), Right Action for Women offers an MRI financial support to young women who are facing the risk of breast cancer as a result of a family history or a genetic predisposition. Patients must have a referral from an approved medical care professional for an MRI screening. Income is limited to 400% of Federal Poverty Level (FPL). Approved assistance has a limit of up to $1,500 per occurrence/MRI during a 6-month period. To get started, call PSI toll-free at: 1-800-366-7741 or visit www.patientservicesinc.org.